The fantasy football waiver wire can often make or break your season. Making the right decision on which players to add and drop is crucial, so we have you set up with a deep list of potential waiver wire adds for Week 13. Lamar Jackson, BAL (25-50%) — We still aren’t sure if Jackson will keep the job when Joe Flacco is fully healthy, but Jackson is capable of putting up QB1 numbers if he remains under center. Jameis Winston, TB (25-50%) — Winston could lose his job at any minute, but he showed last week that he can rack up fantasy points in the Bucs high-powered offense. Gus Edwards, BAL (50-100%) — Edwards notched his second-straight 100-yard game and now appears to be locked in as the Ravens’ lead back. He’s in the RB2 conversation in fantasy. Josh Adams, PHI (50-100%) — The Eagles finally came to their senses and fed Adams the ball in Week 12. Expect a healthy workload to continue going forward. Austin Ekeler, LAC (25-50%) — With Melvin Gordon banged up, Ekeler will be the Chargers featured back for at least Week 13 and perhaps longer. 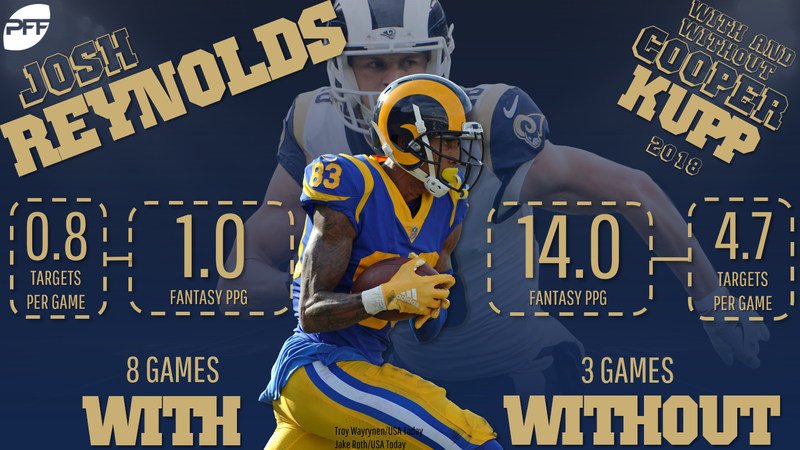 Josh Reynolds, LAR (50-100%) — He’s still available in 66% of leagues and is primed for an every-down role in a potent offense down the stretch. Mike Williams, LAC (20-40%) — With Tyrell Williams banged up, Mike Williams could see an uptick in workload. John Brown, BAL (20-40%) — Sure, he only caught one ball last week, but Brown did see a healthy eight targets. Cameron Brate, TB (25-50%) — If he’s available, Brate is this week’s must-add at tight end. Baker Mayfield, CLV (15-30%) — The new coaching regime is playing to Mayfield’s strengths. He’s thrown seven touchdowns over the last two games. 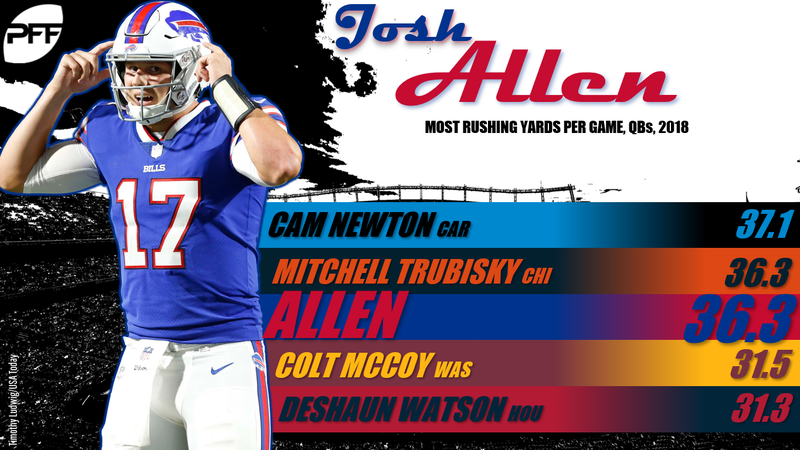 Josh Allen, BUF (5-10%) — Allen was a surprise top-10 fantasy play this past week. He offers upside with his legs, but also comes with loads of volatility. Theo Riddick, DET (10-20%) — Detroit is losing pass-catchers left and right so Riddick should continue to see volume as a receiver. Malcolm Brown, LAR (10-20%) — If something happened to Todd Gurley, Brown would be an instant RB1. Spencer Ware, KC (10-20%) — If something happened to Kareem Hunt, Ware would be an instant RB1. Rod Smith, DAL (10-20%) — If something happened to Ezekiel Elliott, Smith wouldn’t be an instant RB1, but he would be an RB2 with upside. Jaylen Samuels, PIT (7-15%) — Samuels is another premium handcuff who would slide into an favorable role if James Conner went down with an injury. T.J. Yeldon, JAX (5-10%) — With Leonard Fournette suspended in Week 13, Yeldon is the preferred fantasy fill-in in the Jacksonville backfield. Carlos Hyde, CLV (5-10%) — We expect Hyde to lead the Jags in carries with Leonard Fournette sidelined, but T.J Yeldon is the preferred fantasy play. Rex Burkhead, NE (5-10%) — Be careful to not overvalue Burkhead, as his role may be somewhat limited in the Patriots backfield with Sony Michel and James White solidified in their roles. LeGarrette Blount, DET (5-10%) — Blount could be in a lead back role again this week with Kerryon Johnson still banged up. Chris Godwin, TB (15-30%) — Godwin could finally assume every-down duties if DeSean Jackson‘s injury causes him to miss time. Adam Humphries, TB (15-30%) — Humphries doesn’t come with a ton of upside, but he’s scored four times over the last month. David Moore, SEA (10-20%) — Moore has emerged as a solid red-zone option with upside for the Seahawks. Curtis Samuel, CAR (10-20%) — His role continues to expand for the Panthers. Samuel’s versatility is appealing for fantasy purposes. Josh Doctson, WAS (7-15%) — He saw his first double-digit target game of the season last week, catching six balls for 66 yards. Donte Moncrief, JAX (3-5%) — It’s tough to love anything in the Jaguars’ passing game, but Moncrief offers upside if you’re desperate for wide receiver help. Antonio Callaway, CLV (3-5%) — He’s a big play waiting to happen, but Callaway also comes with loads of volatility. Chris Herndon, NYJ (10-20%) — Herndon posted a career-best seven catches in Week 12. David Njoku, CLV (10-20%) — Njoku has been streaky this season, but he flashed fantasy upside with an impressive touchdown last week. Jonnu Smith, TEN (10-20%) — It took a while, but Smith is seeming to hit his stride as Delanie Walker‘s replacement. Colt McCoy, WAS (1%) — He isn’t in play in most leagues, but McCoy should be owned in 2QB leagues. Jeff Driskel, CIN (1%) — With Andy Dalton on injured reserve, Driskel will assume starting duties for the Bengals down the stretch. He’s only in play in 2QB leagues. Jordan Wilkins, IND (1-3%) — Wilkins isn’t a premium handcuff, but he’s a deeper name to stash in case something happens to Marlon Mack. Wayne Gallman, NYG (1-3%) — He isn’t the same caliber of player as Saquon Barkley, but Gallman would be in the RB2 conversation if Barkley went down. Justin Jackson, LAC (1%) — Jackson is a deep name to know after a few impressive runs last week. Bruce Ellington, DET (1-3%) — With Marvin Jones on injured reserve, Ellington should see plenty of work going forward. Dante Pettis, SF (1%) — The rookie is finally healthy and found the end zone last week. 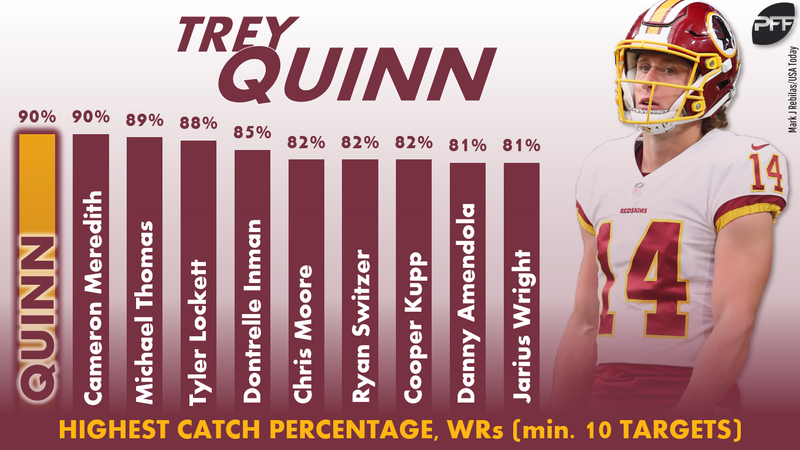 Trey Quinn, WAS (1%) — Quinn has racked up nine catches and a score over the last two weeks. C.J. Uzomah, CIN (1-3%) — Uzomah saw a massive 12 targets last week. Green Bay Packers (1%) — Sure, the Packers defense just put up a fantasy goose egg, but this matchup is just to juicy to pass up. Arizona’s sputtering offense is the No. 2 fantasy matchup for defenses and have allowed double-digit fantasy points seven times this season. That’s tied for the league lead. Seattle Seahawks (1%) — Gone are the days when Seattle was an elite fantasy defense, but they may be able to recapture some of that glory against the 49ers this week. San Francisco just surrendered four sacks and two interceptions to the lowly Bucs defense last week. Miami Dolphins (1%) — This one isn’t a play for the faint of heart, but the Dolphins scream upside against the No. 1 fantasy matchup for defenses. Buffalo seemed to right the ship last week with Josh Allen under center, but we’ve also seen the rookie make plenty of mistakes in his short tenure under center.